I used a SPOT device to track my progress as I hiked the trail. I would check in at the end of each day and when I arrived at each of my resupply locations. I didn’t use the tracking option which creates a bread crumb trail of your journey because it cost extra and chews through batteries. I didn’t carry my SPOT through Oregon to reduce my base weight but had it the whole way through California and Washington. I only had to change the batteries once and that was simply as a precaution through Washington. There were a number of times in bad weather and if I didn’t have a clear view of the sky that the SPOT signal failed to transmit, even though it said it had sent. You should leave the SPOT turned on for at least 30 minutes after checking in to ensure the message goes through. You can also share the link of your location with family and friends so they can check on your progress and see where you are on a map. You can set a password for this link or leave it open for all to view. 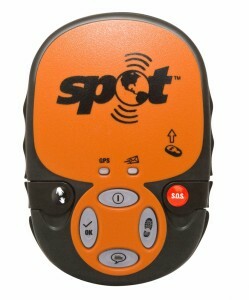 The SPOT allows you to select 10 email addresses or phone numbers to send an alert to when you check in. From Holland we wish you the best of luck on your trail. It will be a great adventure and we’ll love to read how you go. We’ll keep our fingers crossed that the environment, the weather, the animals and off course the people will treat you right. How are you doing? I have had a look through some of your blogging and saw some really neat pictures of some great sites you have been visiting along your trails and it looks like a great venture!!!! I can only imagine the challenges you are facing but you are getting through them and you are still smiling, good for you. I look forward to your regular updates now that I am set up to receive them. Continued good luck on your hike and enjoy!!! Thanks Donny, so glad you’ll be sharing the experience with me! I hope to be posting more great pics soon. Lots of love and see you in Vancouver in September! So … are you going to start carrying your SPOT device again? You bet!! 🙂 It arrives in the mail tomorrow! Hi hows it going ? can i ask u another dull question. On your supply photo with your foods laid out were these split into the same quantities ie 7 days rations or 5 days or the days hiking ? also i know what gatroade is(orange packet) but whats the white packet ? milk powder? Also clothing was the water jacket enough or do you need a thick coat ? Woooooohooooooooooo!!! Closer and closer!! This is so exciting!